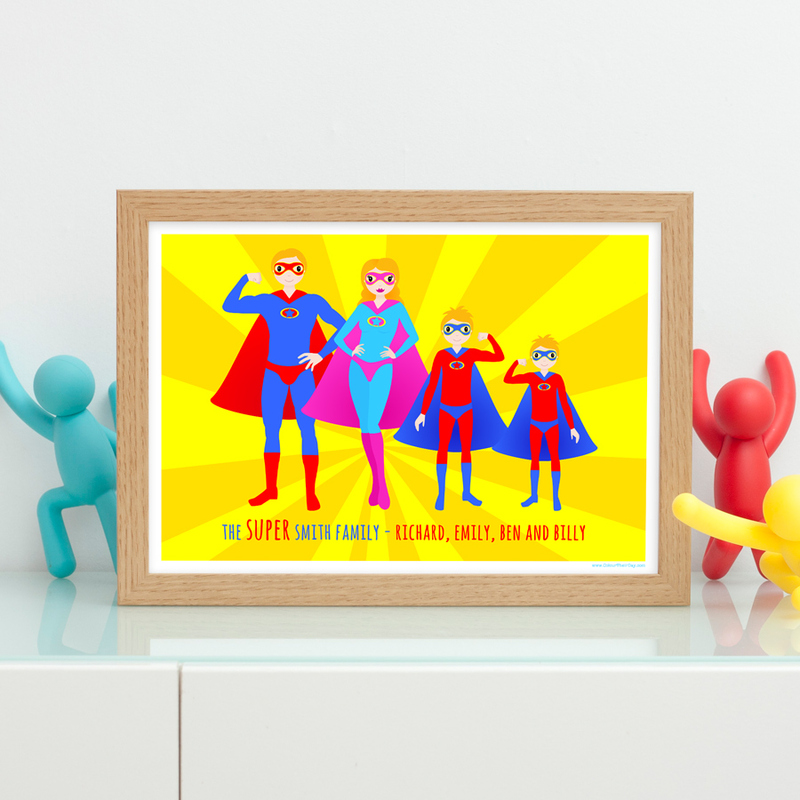 This strong and powerful family of superheroes will make a funny and colourful addition to your family’s wall. 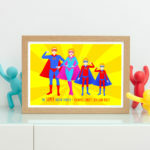 If you are looking for a unique and original gift then this personalised superhero family print will be particularly great for a birthday, Mother’s Day or Father’s Day. 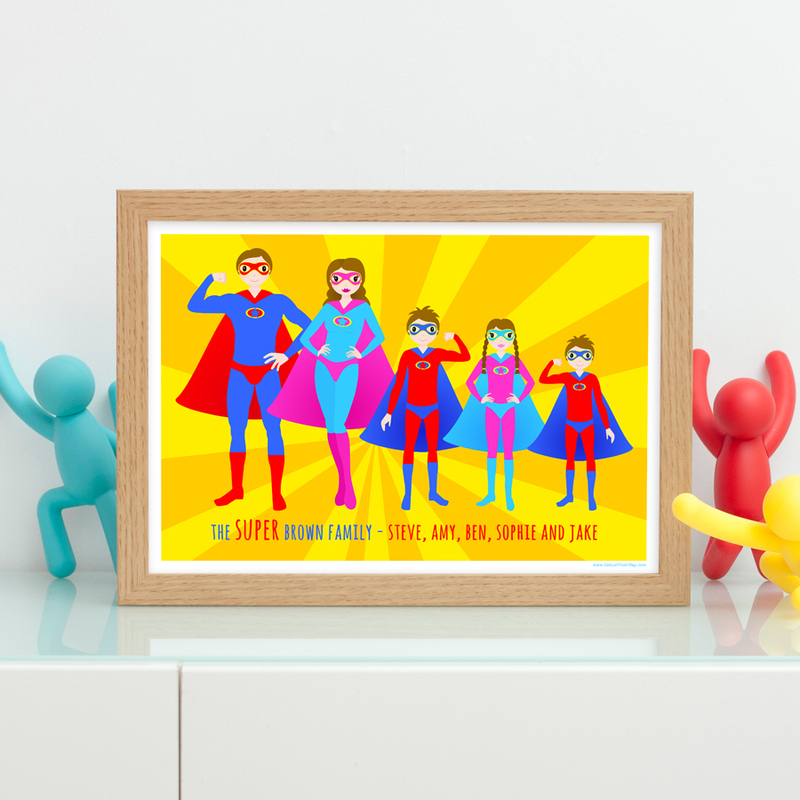 The main design shows a dad and mum superhero with their three superhero children, all lined up against a dynamic yellow background. The design can accommodate up to five people in total; two adults (or one adult, if necessary) and three children. The product images show a selection of some of the different arrangements that will fit. If your family is larger than this and you need more than five superheroes, please contact me with your requirements. The children are all sized according to their age, so this must be filled in correctly in the boxes below. The superhero characters are also personalised to look like your family, please take a look at the example images to see the different skin colour and hair colour options available. Please choose from the three skin colours in the examples; white, dark and black and from the following hair colours; black, brunette, blonde, red or grey. Please contact me if you require any further options. 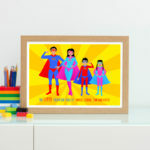 The print is personalised with the family surname and with all the individual family member’s names along the bottom. It is available in A4 unframed, A4 framed and A3 unframed. Please fill in whether you want the first superhero as a dad or a mum and then fill in their name, skin colour and hair colour. Please fill in whether you want the second superhero as a dad or a mum and then fill in their name, skin colour and hair colour. If you do not want a second adult please leave the boxes blank. Please fill in the details of the family member you want next in the line of superheroes. Be the first to review “Superhero Personalised Family Print” Click here to cancel reply.